Better treatments and future cures—those are the goals of our research initiatives. 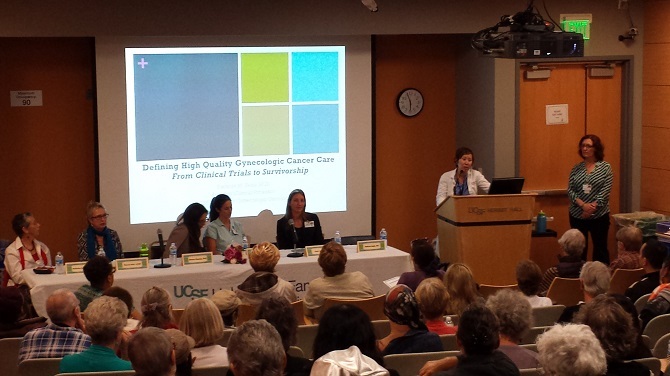 The Division of Gynecologic Oncology has one of the largest clinical trial programs in Northern California. Currently, several clinical trials are opened for women with cervical, endometrial, ovarian, peritoneal, vulvar and fallopian tube cancers. As a self funding program, we would request for your support for our clinical trial program. Your support can help us continue to offer clinical trials to our patients. Our gynecologic oncology tissue bank was established in 1996 and is a clinically annotated resource of tissue and matched blood to support research investigations nationwide. We have contributed high-quality specimens to research projects such as The Cancer Genome Atlas (TCGA) and other NCI designated cancer centers. 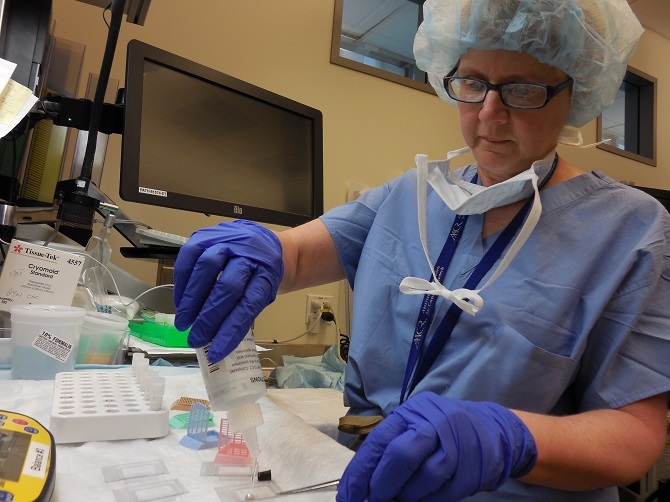 It is the mission of the tissue bank to support both internal and external research investigations to improve our understanding of the biology of gynecologic cancer in service to identifying novel treatments and improving patient outcomes. We currently have more than 1,500 annotated human cancer specimens from the full spectrum of rare and common gynecologic cancers. The Gynecologic Oncology tissue bank is supported by private and departmental funding. We are interested in exploring collaborations. Seventy percent of new cancer cases are diagnosed in low middle income countries (LMICs). Unfortunately, only 5% of the world’s resources are dedicated to these countries. One of the biggest issues is a lack of funding and health care infrastructure, with significantly fewer surgical facilities, medical specialists, and available drugs in LMICs. Through philanthropic efforts, UCSF’s division of gynecologic oncology is working to improve gynecologic cancer care in sub-Saharan Africa. We have developed a bilateral exchange and partnership with the main medical school, cancer institute, and largest public hospital in Uganda. Since 2011, Dr. Stefanie Ueda has been training Ugandan physicians in complex surgery and chemotherapy. A formal educational program and curriculum has been implemented, with the first in-country fellowship started in October 2017. Our program also has been selected by the Society of Gynecologic Oncologists and the International Gynecologic Cancer Society as an official site for volunteer services abroad in gynecologic cancer care and education. We thank you Dr. John A. Kerner for the generous support from the Gwendolyn M. and John A. Kerner, M.D. Gyneclogic Oncology Fellowship in Caring for the Underserved fund and individual patients for this project.If you would like to donate to this project, please feel free to contact our office. As gynecologic cancers can be devastating diseases, they can affect nearly everyone directly or indirectly in our society. In recent discoveries and advance treatments Dr. Chen and the Division of Gynecologic Cancer were able to understand the biology and genetics of these cancers. This helped provide new strategies for prevention, early detection of these cancers, and new types of cancer therapy that target gynecologic cancers more specifically with fewer side effects. As a result, death rates have decreased and the improvement of quality life increased. By viewing these course lectures you will learn how early detection, improvement of side effects from novel treatments assist improve the cure and quality of life for those with gynecologic cancers. For more information about this course please visit UCTV. Your Support Will Make a Difference If you would like to find out more information regarding our cancer research and projects in the Division of Gynecologic Oncology, please contact Dawn Mitchell at [email protected].You can also designate a donation to go to the Division of Gynecologic Oncology at the UCSF “Make A Gift" website. No donation is too small for a big impact!! !